I didn’t know anything about this book when I reserved at my local library, but I just couldn’t put this down. Blended by Sharon Draper was published by Atheneum Books for Young Readers in 2018. Isabella is an engaging character with family problems that feel very real. I wanted to know what would happen, especially through the tension of wedding planning and preparing for her big performance. I also love learning from what I read and this story made me think about individual differences and racism. Boomble. I know that’s not an actual word, but it’s a real sound. I can create any musical combination of sounds on my piano. That’s my superpower. What you’ll admire right away is the voice. Love the main character’s opinions on everything, and especially her own life and her family. It was really interesting the way the book was structured through Isabella’s calendar of days with her mom and days with her dad. My sneakers are sinking into the soft muck of the flower bed. The smell of fertilizer makes me gag. I just want to keep sinking into the mud until I disappear forever. Many kids will relate to this story of being shuffled between two parents and two different cultures and backgrounds. What happens after Isabella and Darren get stopped by the police or even the very fact that they are stopped opens the door for class debate and discussion. If you’re looking for another great list of middle grade books to read, check out Marvelous Middle Grade Monday on Greg Pattridge's blog. This story is so much fun, with lots of great connections for the classroom! Horse is just an oversize dog with funny paws…according to Dog. And Dog? Just a tiny baby horse with a weird tail. That’s what Horse thinks, anyway. Television comedy writer Elliott Kalan and acclaimed illustrator Tim Miller team up in this clever comedy of mistaken species identity. 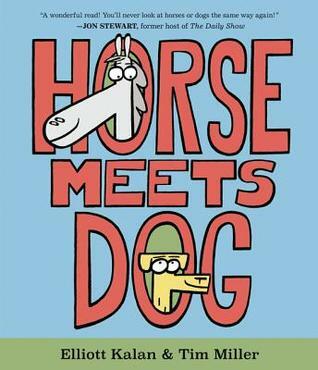 Horse Meets Dog was written by Elliott Kalan and illustrated by Tim Miller. It was published in 2018 by Balzer + Bray, an imprint of HarperCollins. A great example of a story told entirely in dialogue, with the help of some very funny and expressive illustrations. I really love the concept of this story! I noticed how the author uses repetition of phrasing to add to the humor. This is also a great story to study to see how the text and illustrations work together to create humor and emotion. This book reminds me of the Mo Willem’s Elephant & Piggie stories, but in a picture book format. Even though this story is more than the standard 32 pages, the word count is around 400 words. This is a great book to capture the attention of children while also creating opportunities for discussions about listening to others, points of view and individual differences. I’m always looking for books to help kids develop the ability to realize that other people may have a different perspective on a situation—or themselves! Draw or Write: What do you think happens next, when Horse and Dog meet Bird? STEAM: What kind of home would Horse and Dog live in? Build their house! Think & Draw: Think about someone close to you. Do you and that person look the same? What is different about you? What is the same? Design a perfect toy for your person to take on a trip. Discuss: Is Horse bossy? Is Dog bossy? How could Dog and Horse have avoided this big problem? What are some ways to really notice what another person is saying? Check out this funny trailer for the book! Do you think you would like to read this one? I’ve been wanting to read this book for a while. I was so intrigued by the concept of a story about buttons! Stickers, Silly Bandz, Rainbow Looms, fidget spinners . . . buttons?! A brand-new school story about friendship and fads from the bestselling author of Frindle. This is war. Okay–that’s too dramatic. Grace and Ellie have been best friends since second grade. Ellie’s always right in the center of everything–and Grace is usually happy to be Ellie’s sidekick. But what happens when everything changes? This time it’s Grace who suddenly has everyone’s attention when she accidentally starts a new fad at school. It’s a fad that has first her class, then her grade, and then the entire school collecting and trading and even fighting over . . . buttons?! A fad that might also get her in major trouble and could even be the end of Grace and Ellie’s friendship. Because Ellie’s not used to being one-upped by anybody. There’s only one thing for Grace to do. With the help of Hank–the biggest button collector in the sixth grade–she will have to figure out a way to end the fad once and for all. But once a fad starts, can it be stopped? 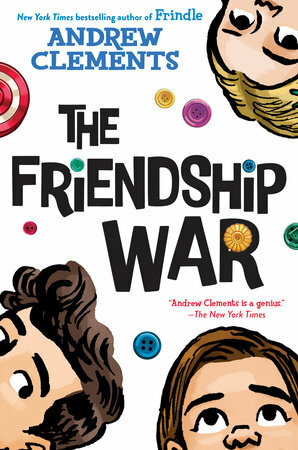 The Friendship War, written by Andrew Clements, was published by Random House Children’s Books in 2019. It was really interesting how the buttons became a fad and created so much conflict between the kids in the story. I also really liked Grace’s personality. She was a kind person trying to do the right thing and thinking about how her actions affected others. Flying from Chicago to Boston by myself hasn’t been as big a deal as my dad said it was going to be. But nothing ever is. You might notice that the pacing is great. I read this story all the way through in one day because I wanted to finish. But what I enjoyed most was the way the author had Grace share her thought processes. She questioned her friendships and what it means to be a friend, reflecting on her own decisions. I loved how she tried to do the right thing, even after things got out of control and everything started to go wrong. When water reaches its freezing point, it turns to ice instantly. And just like that, I feel a decision snap into place—clear and cold and hard. I am not letting Ellie get away with this! You could find so many different things ways to bring this book into classroom activities! There are lots of opportunities to develop math problems from the button collections as well as to talk about data collection and scientific methodology. Grace's enthusiasm for data collection may even rub off on your students. I want to dump all three of the mixed boxes onto my floor and then sort the buttons by shape and size and color and design and material—and especially to count them! I could even put all the information into a graph or a table—really look at the data! What a fun story about working towards goals and being brave! Orville the penguin lives at the zoo, surrounded by animal pals who go on exciting adventures. A hang gliding rhino! A deep-sea diving giraffe! Orville struggles to keep up, until one day he concocts an adventure all his own: build a spaceship and fly to the moon all by himself. Can one tiny penguin get there alone? Penguinaut! is perfect for every child who's said, "I can do it myself!" and comes to find that the rewards are much richer when shared with friends. Marcie Colleen's playful text and Emma Yarlett's charming, whimsical illustrations are sure to delight both children and their parents. Penguinaut! 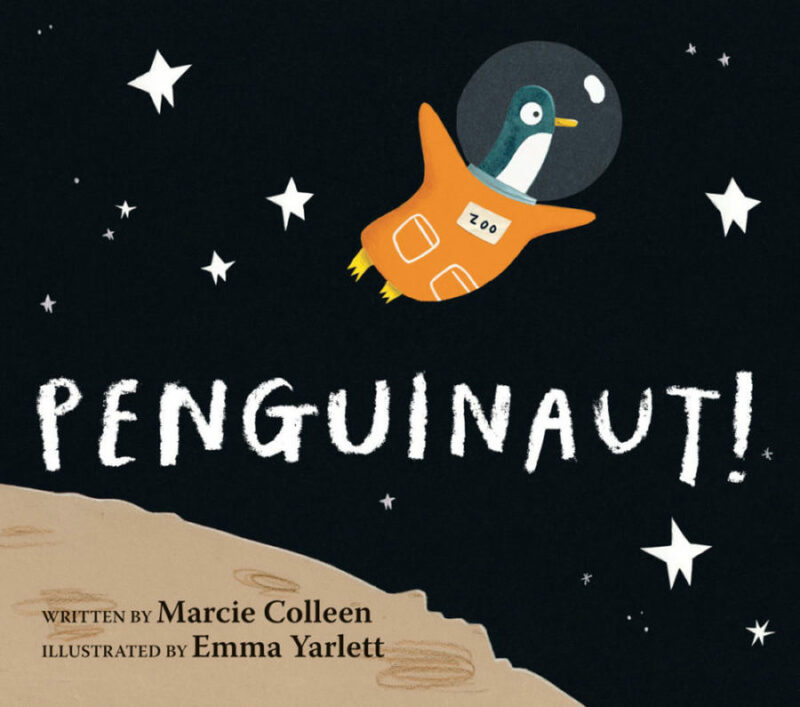 was written by Marcie Colleen and illustrated by Emma Yarlett. It was published in 2018 by Orchard Press, an imprint of Scholastic. And their adventures were bigger. This is an engaging story with gentle humor and simple but fun language, such as “perfectly penguin-sized.” The author has managed to bring out several different emotions within the adventure theme, so it’s a great one to study for thinking about adding different layers to a picture book text. I love the illustrations, especially the one where Orville draws the plans for his rocket. All the characters in the story have characteristic expressions and there are so many fun details for kids to notice as they read the pictures. This is a versatile book for reading aloud in the classroom! It shows perseverance and independence in Orville’s attempts to build his rocket, creativity and imagination as he builds with different materials, and emotions of anxiety and excitement. It’s lovely the way Orville’s friends engage in a little kindness and write him a note of encouragement. Draw: Have you ever had an adventure? What adventure would you like to have? Draw a picture! STEAM: Build a rocket ship using cardboard boxes and other recyclable materials that can fit more than one person or toy. Where would travel in your rocket? Share an act of kindness: Write someone you know a kindness message, like Orville’s friends did in the story. Then hide it someplace where they will find it! Another recommendation from my writing friend Erika David. What a fun and thought-provoking read! 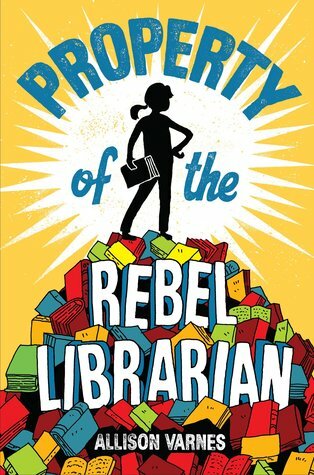 When twelve-year-old June Harper’s parents discover what they deem an inappropriate library book, they take strict parenting to a whole new level. And everything June loves about Dogwood Middle School unravels: librarian Ms. Bradshaw is suspended, an author appearance is canceled, the library is gutted, and all books on the premises must have administrative approval. But June can’t give up books . . . and she realizes she doesn’t have to when she spies a Little Free Library on her walk to school. As the rules become stricter at school and at home, June keeps turning the pages of the banned books that continue to appear in the little library. It’s a delicious secret . . . and one she can’t keep to herself. June starts a banned book library of her own in an abandoned locker at school. The risks grow alongside her library’s popularity, and a movement begins at Dogwood Middle–a movement that, if exposed, could destroy her. But if it’s powerful enough, maybe it can save Ms. Bradshaw and all that she represents: the freedom to read. Equal parts fun and empowering, this novel explores censorship, freedom of speech, and activism. For any kid who doesn’t believe one person can effect change…and for all the kids who already know they can! Property of the Rebel Librarian, written by Allison Varnes, was published by Random House in 2018. I didn’t have parents that grounded me or took away books, but it was fun to explore what might happen if... This is one of my favourite types of middle grade book--funny and fast-paced but with a deeper layer of meaning. The story moved quickly and I got caught up in wondering what might happen to June and her friends. I loved the way the author shows June’s excitement for books and reading, and the way June gradually comes to take a stand. June’s parents are kind of extreme, but once you accept the premise of the story it’s an entertaining read. As a final treat at the end, there’s a reading list of all the books mentioned in the story. You’re going to read a lot about me and the things I’ve done. Most of it is true. You might want to read this to study the writing style, concise and to the point with just the right amount of detail. There's strong voice in this novel and I loved how we saw things from June's perspective, including the details of her outfits and those of other people. I also admired how the author handled June’s relationships with her friends. June is interested in boys and talks about them with her friends, something I don’t always see in middle grade novels but is very evident in school hallways. I also liked the realism of her relationship with her away-at-college sister. This is no longer the same Dogwood Middle. It’s an alternate reality where reading is the coolest thing you can do and I, June Harper, am the leader of the cool kids—of the rebellion. Another great book to include in the classroom or for a book club pick. There's lots to discuss here about censorship, activism, standing up for what you believe in and feeling empowered. I’m always on the lookout for new ways to talk about kindness with my students. This book is perfect for starting a discussion. It was also lovely to see that royalties from this book will be donated to Think Kindness. In a series of simple yet evocative questions, this impactful book asks children how they will show kindness and consideration for others. Written by the editors of Pajama Press, and illustrated by celebrated Pajama Press artists, these stunning pages inspire meaningful discussion and storytelling about the understated yet powerful ways in which children might influence the world around them. A World of Kindness goes beyond mere rhetoric to examine, in a child-friendly way, everyday social interactions where a kind word or act could have a transformative effect on others. 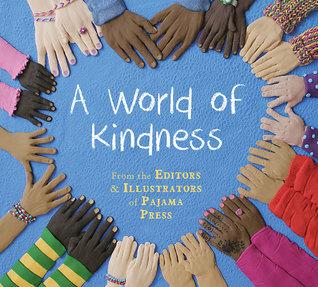 A World of Kindness was written by the Editors of Pajama Press and illustrated by nine illustrators, Suzanne Del Rizzo, Tara Anderson, Rebecca Bender, Brian Deines, Wallace Edwards, Manon Gauthier, Dean Griffiths, Kim La Fave and Francois Thisdale. It was published in 2018. Such a simple text yet so effective! It's really a list of ways to be kind, written as a series of questions. Put together with these lovely illustrations, the text does make me think. This is a perfect book for reading aloud. After an initial read through, educators could talk about one page a day and have a wonderful discussion. It’s also a great book for studying different styles of illustration and what makes them effective. Or to think about how the illustration relates to the text. I also really love the cover. I definitely want this one for my personal collection! List: Make a list of acts of kindness that you could try. create your own art in the style of the artist. do you think the other person felt? Draw: Draw a picture of how you look when you are sad. Write about some things that make you feel better. Could you try those things to help someone else? 'Hummingbirds’ in the title caught my eye—but I was even more intrigued when I discovered the main character was a girl born with talipes equinovarus (clubfoot). “Hummingbirds and angels don’t need two good feet. They have wings.” That’s what Alba’s mother always says. Of course, Alba doesn’t have wings or two good feet: she has Cleo. Cleo is the name Alba has given to her left foot, which was born twisted in the wrong direction. When she points this out, though, her mother just smiles like the world has some surprise in store she doesn’t know about yet. Well, Alba has her own surprise planned. After one final surgery and one final cast, Cleo is almost ready to meet the world straight on—just in time to run in the sixth grade cross-country race. Unfortunately, Alba’s best friend Levi thinks there’s no way she can pull it off. And she thinks there’s no way he’s right about the school librarian hiding a wormhole in her office. Tempers flare. Sharp words fly faster than hummingbirds. And soon it looks like both friends will be stuck proving their theories on their own. 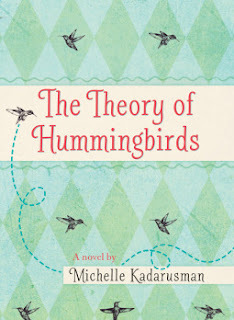 The Theory of Hummingbirds, written by Michelle Kadarusman, was published by Pajama Press in 2017. Alba is a strong and interesting character, determined to reach her dream of running in the cross country race, in spite of the doubts of her parents and her best friend. I really loved all the facts about hummingbirds in this story, and I also liked the secretive librarian and the new friend that Alba met from school. Hummingbirds can’t walk. Their feet are too tiny. They perch, but never walk. I admired the way the author managed to weave so much into her story, which is short compared to many other middle grade novels. What stands out to me is her skill at creating characters. All the characters have definite personalities with strengths and weaknesses. Interactions between them seem realistic, including the interactions between Alba and her mom. And I love the best friend relationship Alba has with Levi, and how they stay friends even after their fight. When the ambulance arrived, the paramedics said I could ride along because Levi wouldn’t let go of my hand. The truth is I never would have let go either. This is such a great book to include in the classroom, because of the way Alba’s foot surgery and abilities are handled so sensitively. As a class read aloud, this would encourage thoughtful reflection about themes related to individual differences, friendship and determination. I pictured myself springing like a gazelle across the finish line. I didn’t want to break the bubble. I didn’t want to see the look Levi would give me again, the look that said I had no business running in the race. The look that said I didn’t belong in Normal Land. If you’re looking for more books for 8 to 12 year-olds, check out the list of wonderful middle grade books over at Marvelous Middle Grade Monday on Greg Pattridge's blog. I have been exchanging manuscripts for critique with the author of this book, Margaret, for a few years, and I am still blown away by her creativity. I was excited to purchase this book for my own collection and to share it with my students. Maximillian Villainous is a monster who doesn’t have the heart to be a villain. His famous family pulls pranks on the likes of Santa Claus and the Tooth Fairy, and Max spends his time undoing them. So when he brings home a bunny to be his sidekick, Max’s disapproving mother hatches a plan. She challenges Max and the bunny to become a devious duo; otherwise . . . the bunny hops. If they want to stay together, Max and the bunny have no choice but to go against their nature. They blunder into villainy with comical effect until Max discovers that embracing his good heart may just be the key to pulling off the most devious deed of all and winning his family’s acceptance. Delightfully fun and irreverent, Maximillian Villainous is an empowering story about embracing one’s true self and finding acceptance. Up and coming illustrator Lesley Breen Withrow brings the characters to life with bold and colorful illustrations in a style reminiscent of Richard Scarry. 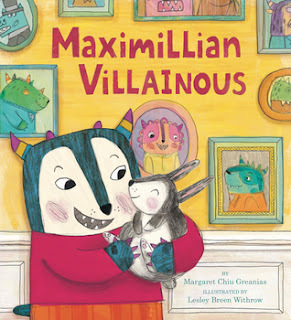 Maximillian Villainous was written by Margaret Chiu Greanias and illustrated by Lesley Breen Withrow. It was published by Running Press Kids in 2018. Maximillian Villainous came from a long line of famous villains. But Max was different from his family. How lovely to read a story where the main character can’t help being kind! Although the theme of a character learning to accept his differences isn’t new, the author has provided a twist by having him come from a family of villains. The ending and solution to his problem was a nice surprise. I really liked the big, colourful illustrations. The main character in this story shows persistence as he makes several attempts to fit in with his family by being villainous. This is a fun read for children, though the idea of a “bunny brigade” may need a little explaining. A nice book for discussions about kindness to others or working towards goals. List: What act of kindness could Max and his bunny try next? Make a list of ideas. Research: What is your family known for? Make a “family tree” and write something each family member is good at. What is your “claim to fame”? STEM challenge: Design and construct your own leprechaun trap. For more Perfect Picture Book Friday reads with teacher and/or parent tips, check out the list on Susanna Leonard Hill’s blog HERE. I was surprised to learn this story was based on a real event! I was so intrigued by this book that I read the whole thing in one afternoon. The polar bear is a royal bear, a gift from the King of Norway to the King of England. The first time Arthur encounters the bear, he is shoved in her cage as payback for stealing food. Restless and deadly, the bear terrifies him. Yet, strangely, she doesn’t harm him—though she has attacked anyone else who comes near. That makes Arthur valuable to the doctor in charge of getting the bear safely to London. So Arthur, who has run away from home, finds himself taking care of a polar bear on a ship to England. Tasked with feeding and cleaning up after the bear, Arthur’s fears slowly lessen as he begins to feel a connection to this bear, who like him, has been cut off from her family. But the journey holds many dangers, and Arthur knows his own freedom—perhaps even his life—depends on keeping the bear from harm. When pirates attack and the ship founders, Arthur must make a choice—does he do everything he can to save himself, or does he help the bear to find freedom? Based on the real story of a polar bear that lived in the Tower of London, this timeless adventure story is also a touching account of the bond between a boy and a bear. 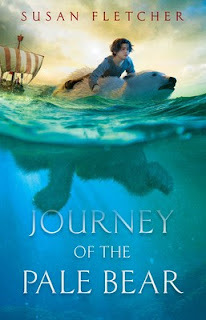 Journey of the Pale Bear, written by Susan Fletcher, was published by Margaret K. McElderry Books, an imprint of Simon & Schuster Children’s Publishing, in 2018. This is a wonderful story about how a boy learns about himself as he learns to love the bear. If you love animal stories, you will enjoy this book! In the evening, as darkness falls, I return to the fortress. A guard lifts a lantern to my face, and at once I’m blind, blinking against the flood of sudden brightness. Before we saw the bear, we heard her—a heavy, rhythmic tread, a thump, a clang. Beyond the reek of fish, I sniffed out the feral musk of her. This book lends itself to discussion about the environment and what it means to be free and wild. There’s a lovely appreciation of nature in this book, as well as some sea adventures and survival elements. I lifted the hatch and peered out. The sun had edged over the horizon, and in the pale morning light I could see the bear pacing slowly back and forth, not far from the sterncastle and the bulk of the crew. Arrows still bristled from her snout, shoulder and leg. 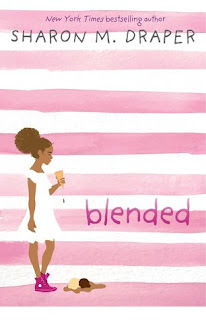 If you’re looking for more to read, check out the list of fabulous middle grade books over at Marvelous Middle Grade Monday on Greg Pattridge's blog. This book was recommended to me by writer Erika David, who also has the dream job of working in the children’s department of a bookstore. I’m so happy she told me about this one because it’s tons of fun! 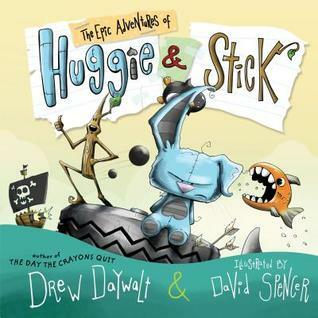 The Epic Adventures of Huggie & Stick was written by Drew Daywalt and illustrated by David Spencer. It was published by Philomel Books, an imprint of Penguin Random House in 2018. Huggie and Stick belonged to a little boy named Reece, and like many things that belong to little boys, they spend a good part of their time being lugged around in a backpack. What a great book to study for learning about voice. I love the two different personalities of the main characters that come through in the letters they write. It’s really fun to see two different perspectives on the same experience. The illustrations are great and add to the humor, especially the little doodle drawings on the letters. I can see this being a big hit with young children. It’d be great to include this in an author study about Drew Daywalt. I might also use this book to introduce the idea of different points of view. It would be fun to assign pairs of students to a random experience, have them each write a letter and then read the results. Write: Pick a random event (or one of your own experiences) and write two letters showing how different characters might view the experience. Explore: Choose one of the continents in the book and do some research. What would you find if you visited? Create a “postcard” from your imaginary adventure. Draw: What will happen to Huggie & Stick on their next adventure? Draw a picture or two to show your ideas! STEM challenge: Can you design a backpack that will keep Huggie & Stick from getting lost (or escaping)? This story about a girl with ADHD and her struggles with friendship is a great read! I might be a little bit biased on this one since Carmella is one of my critique partners and I had the chance to read this book in draft form, long before it was published. But Eliza is such an engaging character I was so glad to get a chance to read more about her! How will Eliza make it through the sixth grade? Her ADHD tends to complicate things. . . .
Eliza Bing stuck with taekwondo and earned her yellow belt even though her family expected her to quit. She’s tough enough to break boards with her bare hands! Next up: middle school, and hopefully a best friend. The school play turns out to be the perfect opportunity to befriend confident, stage-obsessed Annie. But can their friendship survive the spotlight? The joys and sorrows of middle school come to life in this funny and heartfelt sequel to Eliza Bing Is (NOT) a Big, Fat Quitter, recipient of the Christopher Award and four child-voted state award nominations. 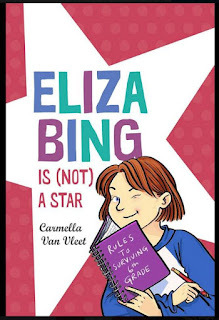 Eliza Bing is (Not) a Star, written by Carmella Van Vleet, was published by Holiday House in 2018. It’s a story about determination and friendship. Eliza is a great character with lots of personality. I really liked how she worked so hard to achieve her goals in taekwondo and how she gradually came to enjoy performing. Eliza’s parents and brother are part of the story too (no dead or banished parents in this story) as well as the family dog. Master Kim once said a good martial artist focuses his or her mind on the lesson at all times. But a million cupcakes says he’s never sat through Mr. Roddel’s lab safety lecture. Sorting socks would be more exciting. This is a great novel to read if you’re studying voice or character. Eliza has a definite personality. I didn’t understand how punching slowly in the air would help me break my board. All I knew was that my gold-belt test was in less than three weeks and I wasn’t sure if I had a fire in my belly or a swarm of butterflies. It’s so refreshing to read a story where a character with a medical condition is shown as they navigate their life, rather than a story that is focused on the condition. Eliza has a lot of issues with her friends and friendships, and I think many kids will be able to connect with this character as she tries to cope with changes in her friendship and learns about herself along the way. A great book for a middle grade book club! Mom liked to say you should try a decision on for size like a coat. That way you can walk around in it for a bit and see how it feels.